Stable solution with inferior picture quality. 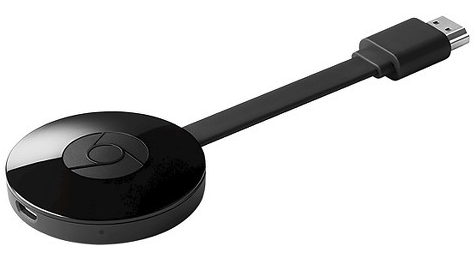 Google's Chromecast devices are small HDMI dongles that are powered through a USB connection or with the supplied power adapter. UPDATE: We also tested the new generation of Chromecast ("Chromecast 3") that was released by Google in October 2018. All our findings for the previous generation outlined below still apply. Those include the inferior picture quality and heavy compression artefacts upon picture changes (e.g. when a new post comes in). Thus we still can't fully recommend using Chromecast to display your Wall. You can then use the Google Home App on your smartphone/tablet to cast the screen's content directly to your TV/projector. Additionally, Google's Chrome Browser is capable of casting your entire screen or individual browser tabs from your PC/Mac: just select "Cast" in the Google Chrome Menu, select your Chromecast and what you would like to cast. The Google support pages have all the details available. Pros: relatively easy to set up through the app, platform independent solution as long as you run Google Chrome or use the Google Home App. Cons: the stream is compressed severely, in our testing, picture quality was often not very satisfying and showed compression artefacts.